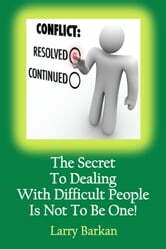 There&apos;s no way around it: From the point of view of the difficult people in our lives, we&apos;re the ones being difficult. If only we would stop resisting and agree that the person we&apos;re calling "difficult" is right and we need to do exactly what s/he tells us to do. Of course, this is exactly what we&apos;re thinking about her/him. It may seem counterintuitive, but once we stop being "difficult," from the point of view of the other person, the other person will stop being difficult as well. This brief guide will demonstrate why this is so and, more importantly, provide seven, simple tactics that can be used immediately to turn that difficult person into a cooperative one.